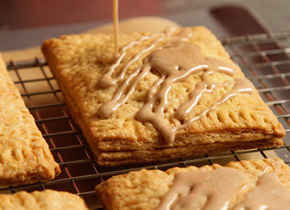 I’ve mentioned before in this space that my go-to breakfast every day before grade school was Pop-tarts… specifically, Brown Sugar Cinnamon Pop-tarts. No frosting — just pure cinnamon sugary goodness with a cold glass of milk. 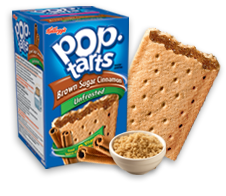 Of course, that was back when most Pop-tarts weren’t frosted. When they weren’t bright, noxious colors with swirls and rainbow sprinkles. When they still looked like breakfast pastries, not Play-Doh experiments. They were just as bad for you — they just looked a whole lot better. If you also prefer Pop-tarts ‘au natural’, have trouble finding them on your grocer’s shelf, AND aren’t scared to turn on your oven, you’re in luck! 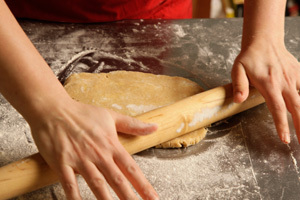 All you need is about 90 minutes, a pizza cutter and a pastry brush. The ingredients and instructions seem pretty simple, too. Take a look at the final product — nice, huh? You’ll notice the recipe includes instructions for a glaze. No doubt a nod to the frosted youth among us. Oh well…at least it’s a color found in nature! File this under the “I can’t help myself” department…. The Bloom Grocery chain has posted billboards along North Carolina highway 150 that feature a ginormous photo of a perfectly grilled steak. Sure, that will catch the eye. But they’ve added a second little something-something: the billboards pump out the smell of black pepper and charcoal. I’ll bet Bloom does sell more steak…and N.C. 150 sees a few more fender benders, too. Haven’t you ever walked through an airport terminal and suddenly found yourself pulled up short by the smell of cinnamon sugar at Cinnabon? Or did an abrupt 180 to purchase a garlic-and-butter coated pretzel that you didn’t even know you wanted at Auntie Annie’s? When those smells hit you out of nowhere, you not only have intense cravings, your body immediately reacts to get you some! These smelly billboards are being placed in the path of people operating heavy machinery.